李晓越, 段淑辉, 周志成, 刘勇军, 李杉杉, 赵中秋, 王萌, 陈世宝. 不同叶面肥对烤烟Cd吸收及烟叶品质的影响[J]. 植物营养与肥料学报, 2018, 24(5): 1330-1337. LI Xiao-yue, DUAN Shu-hui, ZHOU Zhi-cheng, LIU Yong-jun, LI Shan-shan, ZHAO Zhong-qiu, WANG Meng, CHEN Shi-bao. Effect of different foliar fertilizers on Cd uptake by tobacco cultivars and qualities of tobacco leaves[J]. Journal of Plant Nutrition and Fertilizers, 2018, 24(5): 1330-1337. 注（Note）：pH测定值为 4 次样品平均值 ± 标准误差 The pH result is the mean value of 4 samples ± standard error. 注（Note）：FI-1—有机络合锌型叶面肥 Foliar fertilizer containing organic chelated-Zn；FI-2—腐植酸络合钾型叶面肥 Foliar fertilizer containing humic chelated-K；FI-3—硅溶胶铁型叶面肥 Silicon sol iron foliar fertilizer；ND—低于测定下限 Limit of determination. 注（Note）: FI-1—有机络合锌型叶面肥 Foliar fertilizer containing organic chelated-Zn；FI-2—腐植酸络合钾型叶面肥 Foliar fertilizer containing humic chelated-K；FI-3—硅溶胶铁型叶面肥 Silicon sol iron foliar fertilizer；同列数据后不同字母表示同一土壤同一品种不同叶面肥处理间差异显著 (P < 0.05) Different letters mean significant differences among treatments for the same cultivar and soil type ( P < 0.05). 赵爽, 许自成, 孙曙光, 等. 重金属对烟草生长发育及品质影响的研究进展[J]. 甘肃农业大学学报, 2012, 47(2): 62–67. 徐兵, 李云, 裴宏斌, 等. 烟草中镉的迁移吸收与控制研究综述[J]. 作物研究, 2014, 28(8): 931–934. Xu B, Li Y, Pei H B, et al. A review on uptake, translocation and control of cadmium in tobacco plants[J]. Crop Research, 2014, 28(8): 931–934. 雷丽萍, 刘彬, 陈世宝, 等. 不同烟草对Cd吸收的敏感性及烟草中Cd的分布[J]. 农业环境科学学报, 2015, 34(10): 1858–1864. 雷丽萍, 陈世宝, 夏振远, 等. 烟草对污染土壤镉胁迫的响应机制及影响因素研究进展[J]. 中国烟草科学, 2011, (4): 87–93. 田阳阳, 陈江华, 张艳玲, 张仕祥. 不同Cd积累基因型烟草中Cd的亚细胞分布及化学形态[J]. 烟草科技, 2012, (2): 66–70. Clemens S, Mark G.M. Sébastien A E, et al. Plant science: the key to preventing slow cadmium poisoning[J]. Trends in Plant Science, 2013, 18(2): 92–99. 龙思斯, 雷鸣, 杨勇, 等. 三种类型阻控剂对不同品种水稻富集镉的影响[J]. 农业资源与环境学报, 2016, 33(5): 459–465. Long S S, Lei M, Yang Y, et al. Effects of three inhibitors on the accumulation of cadmium in rice (Oryza sativa L.) [J]. Journal of Agricultural Resources and Environment, 2016, 33(5): 459–465. 靳磊, 胡召华, 纪雄辉, 等. 不同时期喷施Zn肥抑制水稻Cd吸收转运的效果[J]. 湖南农业科学, 2017, (8): 37–40. Jin L, Hu Z H, Ji X H, et al. Effects of zinc foliar application at different growth stages on cadmium absorption and transport in rice[J]. Hunan Agricultural Sciences, 2017, (8): 37–40. 刘永贤, 潘丽萍, 黄雁飞, 等. 外源喷施硒与硅对水稻籽粒镉累积的影响[J]. 西南农业学报, 2017, 30(7): 1588–1591. Liu Y X, Pan L P, Huang Y F, et al. Effects of selenium or silicon foliar fertilizer on cadmium accumulation in rice[J]. Southwest China Journal of Agricultural Sciences, 2017, 30(7): 1588–1591. 刘世亮, 化党领, 刘芳, 等. 烤烟多功能叶面肥对烟草生长及品质影响[J]. 中国农学通报, 2007, 23(12): 257–260. 谭军, 周冀衡, 李强, 等. 氮素形态对烟草黑胫病发生的影响[J]. 中国烟草科学, 2017, 38(4): 80–85. Tan J, Zhou Y H, Li Q, et al. Effects of nitrogen forms on the occurrence of tobacco black shank[J]. Chinese Tobacco Science, 2017, 38(4): 80–85. 张梅华, 姜朵朵, 于松, 等. 叶面肥对农作物阻镉效应机制研究进展[J]. 大麦与谷类科学, 2017, 34(3): 1–5. Zhang M H, Jiang D D, Yu S, et al. Research progress on the cadmium resistant mechanisms of foliar fertilizers on crop[J]. Barley and Cereal Sciences, 2017, 34(3): 1–5. Taylor P. The wetting of leaf surfaces[J]. Current Opinion in Colloid & Interface Science, 2011, 16(4): 326–334. 鲍士旦. 土壤农化分析[M]. 北京: 中国农业出版社, 2013. Bao S D. Soil and agro-chemical analysis methods[M]. Beijing: China Agriculture Press, 2013. Lu R K. Soil and agro-chemical analysis methods[M]. Beijing: China Agricultureal Science and Technology Press, 2000. GB/T17141-1997. Soil quality–Determination of lead and cadmium-graphite furnace atomic adsorption spectrophotometry[S]. 贝美容, 罗雪华, 杨红竹. AA3型连续流动分析仪-CFA-同时测定橡胶叶全氮、全磷、全钾的方法研究[J]. 热带作物学报, 2011, 32(7): 1258–1264. 介晓磊, 黄向东, 刘世亮, 等. 不同氮素供应对烟草品质指标的影响[J]. 土壤通报, 2007, 38(6): 1150–1153. 朱忠, 冼可法, 尚希勇. 中上部不同成熟度烤烟烟叶与主要化学成分和香味物质组成关系的研究[J]. 中国烟草学报, 2008, 14(1): 6–12. Dordas C. Role of nutrients in controlling plant diseases in sustainable agriculture. A review[J]. Agronomy for Sustainable Development, 2008, 28(1): 33–46. 雷丽萍, 陈世宝, 孙聪, 等. 溶液Ca, K浓度和pH对烟草Cd毒性的影响[J]. 中国烟草科学, 2012, 33(4): 79–84. Lei L P, Chen S B, Sun C, et al. Influence of Ca, K concentration and pH value in solution on Cd toxicity to tobacco in solution culture[J]. 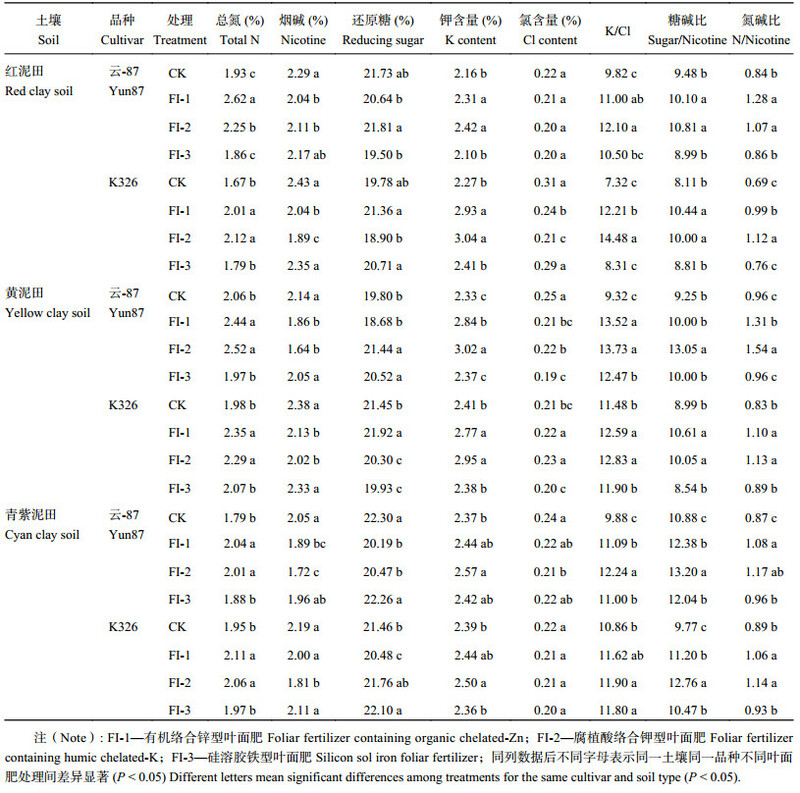 Chinese Tobacco Science, 2012, 33(4): 79–84.